There are 4 Rules of Gun Safety that must be followed 100% of the time. When the rules are followed accidents can be minimized. Being a gun owner means that you have made a commitment to knowing these rules and living them. Responsible gun ownership means learning and practicing behaviors that will help prevent needless injury, death, and theft. #1 Treat all guns as if they are always loaded. An individual who properly inspects and shows a gun to be clear before further handling is seen as a responsible and knowledgeable participant at the range. Take the time to treat every firearm that you come in contact with as though it COULD be loaded. Never assume that someone has handed you an unloaded gun. Take the time necessary to see safely inspect the firearm yourself before moving on. Never accept into your possession a firearm that you are unfamiliar thinking that you can fiddle with it until you figure it out. You will never be wrong to ask for assistance and a demonstration of safe and correct usage of that firearm. #2 Never let the muzzle cover anything that you are not willing to destroy. Situational awareness is critical to firearm safety. Before you make contact with the firearm consider your environment and determine your safe direction. If you are at an indoor or outdoor range and are unsure, ask. It is your responsibility to ALWAYS keep the gun pointed in a safe direction 100% of the time whether you are setting up in your work area, loading, reloading, shooting, showing clear, or laying the firearm down on the bench. When walking with or transporting a long gun muzzle is Up or Down and the firearm is unloaded. If you are unsure about your range’s rules for transportation, casing/uncasing your firearm in respect to muzzle direction, ask. #3 Keep your finger off the trigger until your sights are on target and you have made the decision to shoot. Trigger finger discipline is a learned skill and is vitally important to maintaining the safe condition of the firearm at all times. Your “Trigger Finger” must become your “Safety Finger.” From the moment you make physical contact with the firearm your finger must be kept straight and rest along the side of the frame. Through all administrative actions, such as, but not limited to, picking up, loading, reloading, fixing malfunctions, unloading or resting in various ready positions your finger is in this indexed position along the frame. Only when it is appropriate to shoot, your sights are on target and you have made the decision to shoot that you are able to move your finger from it’s indexed position onto the trigger. #4 Be sure of your target and what lies beyond it. You are responsible for everything which a round you shoot comes in contact with. This means another big dose of situational awareness BEFORE you make the decision to shoot! Consider the height of your target and the angle at which you will shoot it. If the round would make an impact through you intended target and impact something other than a bullet safe berm, trap or safe zone then you are obligated not to take the shot. This means never point or fire ar anything you can’t clearly identify as a target or that would be a danger if your bullet strays, ricochets, or over penetrates. Bonus Rule: Always Secure Your Firearm from Unauthorized Persons. Store your guns so they are not accessible to unauthorized persons. This includes friends, children, welcomed guests, or unwelcome visitors, such as criminals in your home. 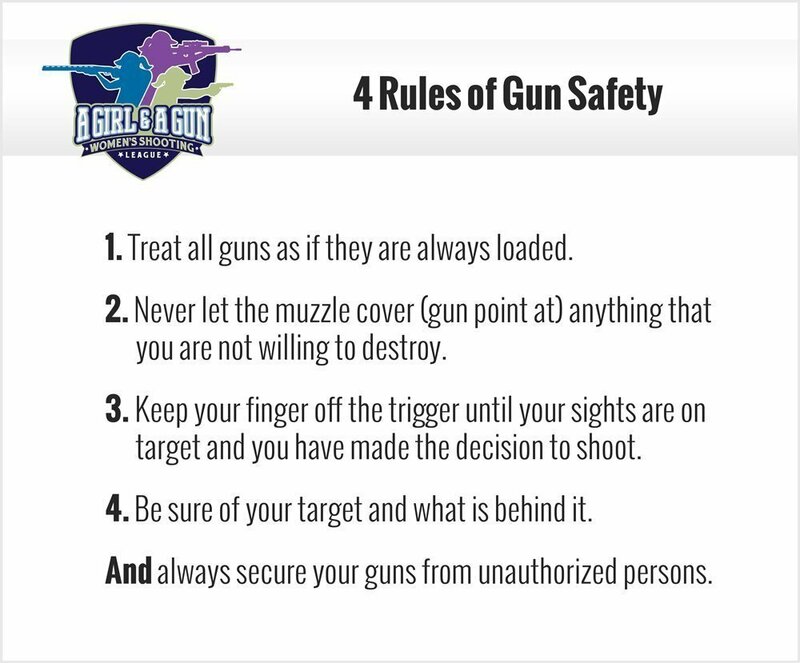 The Rules of Firearm Safety are so important that A Girl & A Gun shows them to you all the time: on your membership card, on its website, on Facebook, etc. We never get tired of reviewing them and neither will you! Wear eye and ear protection, as appropriate. Never use alcohol or prescription or other drugs before or while shooting. Be aware that certain types of guns and shooting activities require additional safety precautions. Frequently service and maintain your firearm. Be an Active Participant in Safety! Visiting a new range? Each venue has rules in addition to the fundamentals that are unique to their location, terrain, and bylaws. Take the time to review the range’s safety rules and ask any questions before participating. This is also true for different shooting sport events, which may have event rules for where, when, and how you are allowed to handle your firearm. There may also be specific rules for spectators as well. It is always a good idea to review the rules ahead of time to ensure your experience at the range is safe and fun. If you feel confused, unsure, overwhelmed, or uncomfortable, choose to opt out of shooting. Not taking the shot is the best and safest thing to do. If you feel that the course of fire, target placement, or speed of the drill would result in your potentially breaking any of the Firearm Safety Rules, it is your obligation not to take the shot. If at any time during a class, event, or practice session you find that you are unsure that your actions could become unsafe give yourself permission to PAUSE! You and only you are in 100% control of the firearm in your possession. Know yourself and trust yourself enough to stay in control of your thoughts, emotions, and actions. 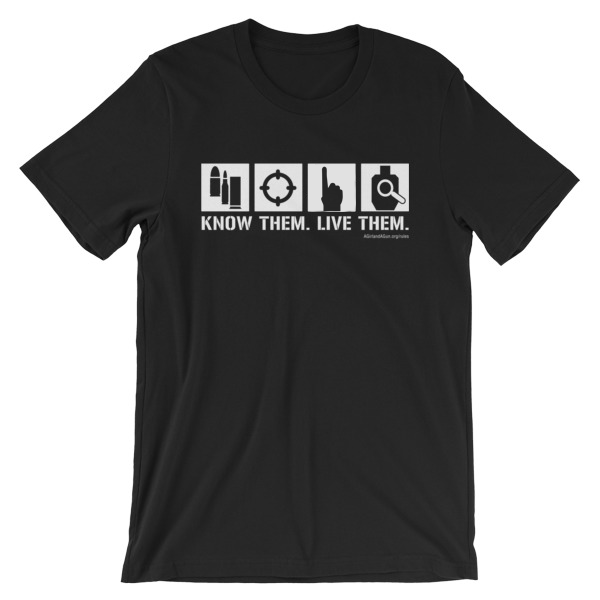 An individual who can stay in control of themselves and their firearm to maintain the safety of all is someone who is greatly respected at a range. 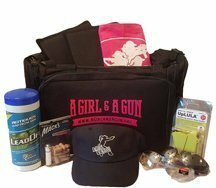 At A Girl & A Gun we you permission to take a “tactical time out,” a mini break, or ask for further clarification when you need it. 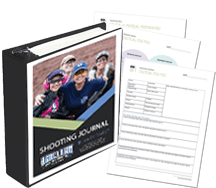 Shooting is fun, safe, and a place for you to invest in yourself.